Team USA released their provisional roster today for the 2013 World Baseball Classic. 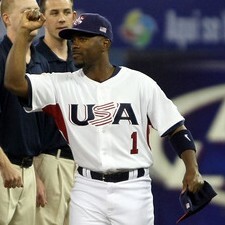 Shortstop Jimmy Rollins is the lone Phillies representative representing the stars and stripes. Rollins is one of three players, the other two are Shane Victorino and Ryan Braun, who return to Team USA from 2009’s team. Rollins is projected to be the team’s starting shortstop and is hoping to duplicate his 2009 performance when he was named to the All-WBC Tournament Team. Rollins is joined in the tournament by three Phillies’ teammates, Phillippe Aumont, Tyson Gillies, and Pete Orr on Team Canada, as first reported at Phillies Nation on Sunday.